This article was originally published on the Common Ground News Service website. London- Egyptian journalist Mona Eltahawy unleashed a veritable media storm on Arab gender relations with her recent article for Foreign Policy magazine, provocatively titled, “Why Do They Hate Us?” referring to male attitudes towards women. Amid the controversy, however, important questions risk being overlooked. Instead of dwelling on whether Arab men really do hate women, our attention might be better focused on formulating strategies to achieve gender equality. Eltahawy may be doing gender relations a great service by raising awareness about the need for supporting women’s rights, but her tone is controversial. The article, illustrated with photographs of a naked woman covered in black body paint suggestive of a niqab, is an impassioned diatribe against the poor condition of women’s rights in the Arab world. The author lists a catalogue of abuses women suffer, including her own beating and sexual assault at a protest in Cairo last year, attributing such attitudes to “a toxic mix of culture and religion”. The crux of her argument is that Arab women live as second-class citizens because they are “hated” by men. “Our political revolutions will not succeed unless they are accompanied by revolutions of thought – social, sexual, and cultural revolutions that topple the Mubaraks in our minds as well as our bedrooms”, she writes. Her critique immediately led to a crescendo of emotionally charged responses, with some lauding the Egyptian writer for her bravery. Her detractors have been more vocal, accusing her of promoting simplistic views that pander to Western stereotypes of Arab women as victims in need of rescuing from a misogynistic Islam. Eltahawy certainly did not start the debate on women’s rights in the Arab world, but she has helped popularise it. On social media websites and in cafes, Arabs of different economic and religious backgrounds are busy contemplating the status of the region’s women. But ignored in the debate is the existence of many Arab men working in solidarity and partnership with women to exorcise the scourge of gender inequality from their communities. A sizeable number of men are equally or increasingly involved in family duties traditionally seen as women’s work, such as child-raising, cooking and housework. We would do well to consider ways to further improve men’s involvement in the struggle for gender parity. More and more Arab men are joining in women’s struggle for greater freedoms, accompanying them on demonstrations and viewing gender equality as integral to their vision of a better society. Some, like the Egyptian writer Ahmed Kadry, have taken to the blogosphere to call for an end to sexual harassment of women. Indeed, Arab feminism has found supporters among men throughout its long history- men who realise that they are equally held captive by strict interpretations of gender expectations. Loaded language about hate has the advantage of drawing attention to an issue, but risks alienating the very audience that needs to be engaged with. Viewing men as hateful does little to promote the end goal of all gender activists, which is greater freedom and dignity for women. Instead, initiatives that increase men’s involvement in and sense of ownership of gender equality must be fostered. Grassroots projects to rehabilitate male perpetrators of gender-based violence, such as those run by the Lebanese organisations KAFA (Enough), an organisation working to end violence and exploitation, and the ABAAD Resource Center for Gender Equality, are doing just that, helping transform misogynistic attitudes towards women. As Arab women and men, we must harness the angry indictments of inequality that Eltahawy has rightfully brought to our attention into proactive action. Rather than laying the blame for women’s disempowerment at the doorstep of “men” or “culture”, we should use peaceful and inclusive dialogue to reinforce the idea that women’s rights are everyone’s concern. To paraphrase the physicist Albert Einstein, one cannot solve a problem with the same mind that created it. Finger-pointing and blame games will only create further antagonism. Until women and men unite to throw off the chains of strictly dichotomous gender roles and identities, we are all culpable in perpetuating the disempowerment of our societies as a whole. The so-called Arab Spring may have disappointed many, but it is not over yet. These tumultuous times present an important opportunity for the region, and indeed the world, to engage in an inclusive and peaceful battle for greater freedoms for all. Women have occupied a central role in the popular uprisings that have raged across the Arab world in the last year. The faces of political activists like Yemen’s Tawakul Karman, Syria’s Razan Ghazzawi and Tunisia’s Lina Ben Mhenni have, at least in many Western media outlets, become emblematic of regional calls for greater democracy and improved living conditions. With the global spotlight shining on Arab women, it was not altogether unsurprising when organizers of the annual New Arab Woman Forum (NAWF) chose women’s role in the revolutions as the theme for their Beirut meeting earlier this month. Al-Hasnaa, a pan-Arab women’s magazine based in Lebanon, has organized NAWF for the last five years. It brings together prominent personalities from across the region for two days of discussions on the place of women in Arab society, culture, politics, and economic activity. Despite the stated interest in advancing women’s causes, NAWF was met with scathing criticism from Arab feminists and disappointed attendees who dismissed it as a public relations venture with only a superficial interest in gender equality. Even before the meeting had taken place, Lebanese women groups led by the feminist collective Nasawiya, had issued a press release condemning the elitist nature of the forum, which was held at a five-star hotel at a fee of $300 per person. “It felt less like an enriching debate and more like watching people have coffee,” feminist activist Paola Salwan Daher complained. Such vitriol against the conference is not new- NAWF has been dogged by criticism since its inception. During the 2009 forum, a number of participants left in disgust after Lebanese journalist May Chidiac launched a sectarian tirade against Belgium’s first veiled MP, which culminated in the politician bursting into tears. Detractors say crucial debates, such as women’s rights to divorce or to equal protection and standing before the law, are virtually ignored. They also complain that the forum favors celebrity endorsements over speakers with actual involvement in advancing women’s rights. The event is usually held under the patronage of a high profile woman, such as Emirati Princess Haya Bint Al Hussein, Lebanese first lady Wafaa Sleiman or MP Bahia Hariri, sister of Lebanon’s assassinated former Prime Minister Rafik Hariri – women who are arguably more famous for their attachment to ruling men than for their individual commitment to women’s rights. In keeping with its theme of women in the revolutions, this year NAWF organized a short march for participants to call for gender equality in the region. The choice of route was itself indicative of the socio-economic group present at the forum, with marchers starting from the luxury Four Seasons hotel and walking through the upscale streets of Downtown Beirut, which are privately owned by the controversial construction company Solidere. “In the end, the protest was a symbolic action by women of the upper classes who wanted to take part in the Arab Spring in their own way,” wrote Lebanese journalist Ahmad Mohsen. In an irony that was perhaps lost on her audience, one NAWF speaker used a panel discussion on the Arab uprisings to criticize the exclusivity of mainstream Arab women organizations. “I call on women’s movements to rethink their elite discourse, which is far removed from the experiences of poor marginalized women,” said Nabila Hamza, the Tunisian head of Foundation for the Future, a Jordanian organization. In response to criticism about the hefty conference fee, this year NAWF invited a number of students to attend for a “symbolic” $20. The concession did little to appease the anger of many women’s groups, however. “There was no real economic diversity in the rooms of a deluxe hotel, in a country where the average salary is $700 a month and where many households need to have two jobs or side occupations to make ends meet,” Daher wrote. More than 230 years later and thousands of miles away in tiny Lebanon, Adam’s words have gained renewed urgency. In mid-June, after five months of intense negotiations, Prime Minister Najib Mikati finally unveiled his new Cabinet. Not one of his 30 appointees is a woman. “Women hold up half the sky,” as the Chinese proverb goes, but in many parts of the world they are still being forgotten by the governments that are supposed to represent them. While the absence of women from political life is typical in other Arab countries, like Saudi Arabia, Lebanese women have enjoyed at least symbolic representation in their government since being given the right to vote in 1952. Before the previous government was brought down in January, there were two women in the Cabinet, holding the finance and state portfolios, and four women among 128 parliamentarians. Though this amounts to a paltry 3.1 percent, most activists were optimistic it would, in time, gradually increase. If being deprived a share of the Cabinet wasn’t bad enough for Lebanese women, their role in society has been further called into question by the disappointing comments of the country’s most senior Sunni leader. Grand Mufti Mohammad Qabbani recently condemned efforts to introduce legislation protecting women from domestic violence as a Western plot against Muslim family values. These seem like strange words indeed when one recalls Lebanese citizen Charles Malik’s pioneering role in drafting the 1948 Universal Declaration of Human Rights — a document firmly committed to ending gender discrimination and one that the Lebanese have enshrined in their Constitution. Mr. Qabbani seems to have overlooked the fact that Lebanon helped articulate those very values he now accuses of being foreign and which many other Muslim leaders would call an integral part of their religious beliefs. Unfortunately, the masculinization of Lebanon’s government is just the latest in a string of major blows to women’s political participation in the Arab world as a whole. Women were at the helm of the uprisings in Tunisia, Yemen and Egypt, but only one has been appointed to the new 27-member Cabinet in Cairo and plans for a woman’s quota introduced last year have been abandoned. In Tunisia, where women formerly held over a quarter of parliamentary seats, they head only two of 31 ministries now. Developments in Lebanon thus may well herald the beginning of retrogressive steps on women’s rights throughout the region. This apparent sleepwalking backwards increasingly goes against the grain of global attitudes towards women, whose participation in decision-making is now an internationally recognized marker of social progress and is on the rise every year. The United Nations has, since 2000, led initiatives to mainstream women’s active role in the public life of their countries, issuing several resolutions in this regard. Lebanon should embrace its historical role as a defender of human rights and implement those resolutions in good faith. Women must become an integral part of decision-making bodies if Lebanon and other Arab countries want to enjoy real democracy and truly serve the needs and aspirations of their people. The political participation of women is a matter of justice, not a privilege they should have to fight for. The sisters of Abigail Adams should not have to wait any longer for their rights to be recognized. BEIRUT: Women in Lebanon may not seek out political leadership positions as often as men but they are potentially more likely to vote in elections, a new study has found. Results from “The Status of Women in the Middle East and North Africa Project” were released on Wednesday and Thursday to non-governmental organizations and academics, who also received training on how to use the data effectively to advocate policy change. The International Foundation for Electoral Systems (IFES) and the Institute for Women’s Policy Research (IWPR) carried out the study with funding from the Canadian International Development Agency as part of survey data collection in Lebanon, Morocco and Yemen. “The general goal was to collect data on the status of women, especially in areas where there are gaps,” such as social attitudes toward policy change and women’s perceptions of themselves, said Rola Abdel-Latif, a research officer at IFES and the survey’s specialist. Lebanon’s parliamentary elections in June 2009 were widely acclaimed as the most competitive in years. Out of a total of 587 candidates, however, only 12 were women, a figure that translates into about 2 percent. 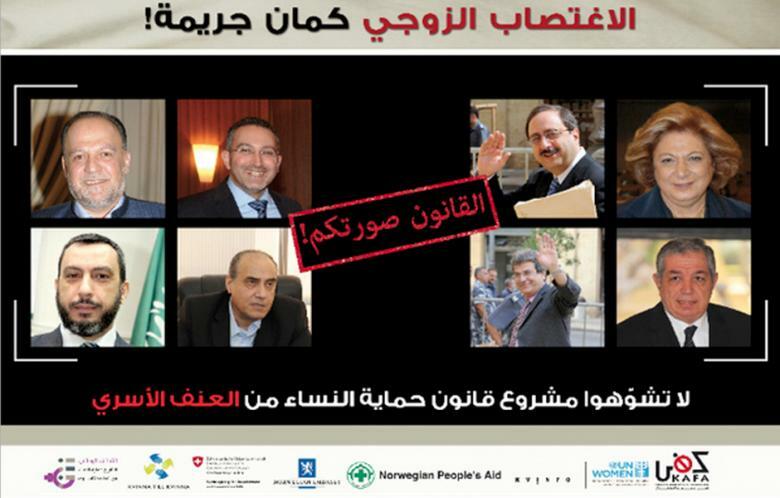 Out of those 12, only four were elected to Lebanon’s 128-member Parliament. In contrast to poor political representation, the IFES/IWPR survey found women had a “slightly higher voter turnout” than men in the elections, with 80 percent saying they voted, versus 78 percent of men. The results confirm those of a January study by the Lebanese Council of Women, which found slightly more women had gone to the ballot box than men. IFES/IWPR said improving the status of women was at the bottom of the agenda for both men and women voters, with only 13 percent of women and 8 percent of men mentioning it as one of the issues to be prioritized. Men and women both prioritized the same three factors that influence their votes: candidates who are not corrupt, services that candidates provide to their area, and candidate’s platform. The survey also found widespread support for the adoption of a women’s political quota, Abdel-Latif said, with more than two-thirds of respondents supportive. Nevertheless, “this is in contrast to what we seen in Lebanon, where very few people actually go and vote for women,” it said. Researchers also noted some “surprising” results, such as the fact more women (64 percent) than men (54 percent) are opposed to creating an optional civil marriage law, which would give couples the freedom to marry outside of religious establishments. “Unfortunately women are more opposed to this, even though the personal status laws in Lebanon are more against women than men,” Abdel-Latif said. She pointed to the important role to be played by civil society organizations in raising awareness about the benefits of a civil marriage option. Currently, Lebanese can only be married by a religious authority, although Beirut does register civil marriages performed abroad. The survey found an overwhelming majority of Lebanese, both men and women, supported reform of Lebanon’s discriminatory nationality law. 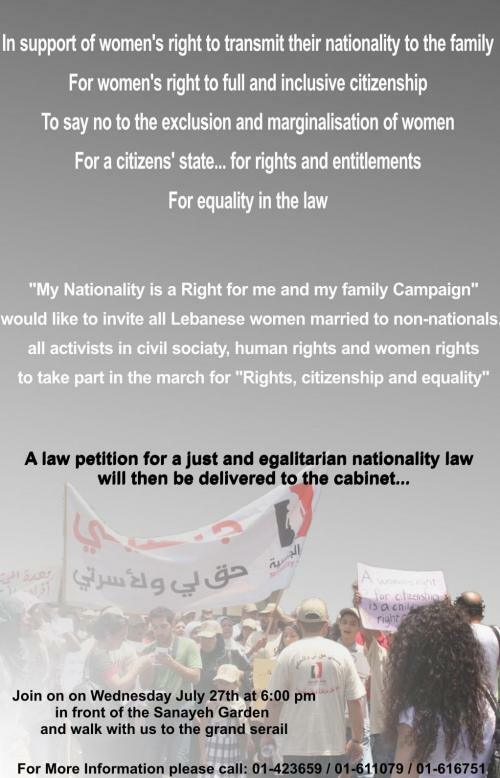 Lebanon’s current citizenship law allows men to pass on their nationality to non-Lebanese wives and children one year after their marriage is registered, but prohibits Lebanese women married to non-Lebanese from doing the same. The results of 82 percent of women and 73 percent of men supporting a change to the law were “pretty encouraging,” Abdel-Latif said. Although the survey found that there was equal access to education between the genders, it also found a considerable gender gap in income. “Men who work for pay make much more money than women who work for pay,” Abdel-Latif said. Almost six in 10 women in Lebanon make less than $500 a month, compared to 30 percent of working men. Some 20 percent of men make more than $1,100, compared to only 7 percent of women. “There are still a lot of Lebanese women employed in traditionally feminized fields,” such as cosmetology or teaching, Abdel-Latif said. BEIRUT: Lebanon’s new Cabinet must not forget its duty to work toward granting Lebanese women nationality rights, despite its apparent omission of the issue in the ministerial statement, gender-equality activists said Wednesday. Over 100 people heeded the call of social justice organization Collective for Research and Training on Development-Action (CRTD.A) to demand an overhaul of the current discriminatory legislation, formulated in 1925. The law allows men to pass on their nationality to their non-Lebanese wives and children but forbids Lebanese women married to non-Lebanese from doing the same. This injustice is further exacerbated by Lebanon’s reservation on Article 2 of paragraph 9 of the UN Convention of the Elimination of All Forms of Discrimination against Women, pertaining to nationality rights. There are about 18,000 Lebanese women married to non-Lebanese living in Lebanon and over 80,000 people affected by the current legislation, including children and spouses, according to the United Nations Development Program’s (UNDP) “Toward Reforming the Nationality Law in Lebanon” project. CRTD.A launched the regional Nationality Campaign nearly a decade ago to demand reform of discriminatory nationality laws. Since then the campaign has met with considerable success, with Algeria, Morocco and Egypt changing their laws, said CRTD.A executive director Lina Abou-Habib. More recently, Bahrain adopted measures guaranteeing equality for women and Syria has enforced laws stipulating gender equality in education. “We are witnessing progress in the region. There is no excuse for Lebanon not to join in,” Abou-Habib said. Viewed as illegal aliens, those without Lebanese citizenship face myriad difficulties, including obtaining employment or affordable education and health care, are required to go for regular medical check-ups and blood tests, and face the threat of deportation every day. The difficulties faced by those without citizenship was on Wednesday apparent as audience members emotionally recounted painful experiences. Abou-Habib reiterated the Nationality Campaign would not accept reform of the nationality law that excludes Palestinians. Those against an amendment of the law have argued that the naturalization of thousands of Palestinian men and children would tip Leba­non’s delicate sectarian balance in favor of Sunni Muslims, the religion of the majority of the country’s 400,000 Palestinian refugees. But rights activists have pointed out that less than 2 percent of Lebanese women are married to Palestinians. “Any nationality law that comes with exceptions would be unconstitutional,” Abou-Habib said, referring to the Constitution’s demand for total equality between men and women. While nationality rights are important in their own right, Lebanon’s sexist legislation is only one manifestation of gender inequality, activists said. In a statement earlier this month, the Nationality Campaign urged ministers to include “clear statements” in the upcoming Ministerial Statement on how they intended to push forward gender equality. In particular, they de­manded clauses addressing the right for Lebanese women to pass on their nationality, the implementation of a women’s quota for municipal polls next year, and the approval of a proposed family-based violence bill. But the Cabinet has already disappointed them. Abou-Habib said Interior Minister Ziyad Baroud had told members of the Nationality Campaign last Friday that out of 30 ministers, which include two women, only he and Information Minister Tareq Mitri had called for the ministerial statement to include a clause acknowledging the need to reform the nationality law. Lebanese politicians’ inaction has only reasserted the determination of activists to persevere with their demands. “We’re going to go through with the na­tionality campaign and we won’t wait for any MPs to take action,” said one audience member.